And how she cleverly DIY’d most of her wedding! What happens when a cookbook author/food stylist gets married? A pretty epic wedding, party, and food selection, of course. 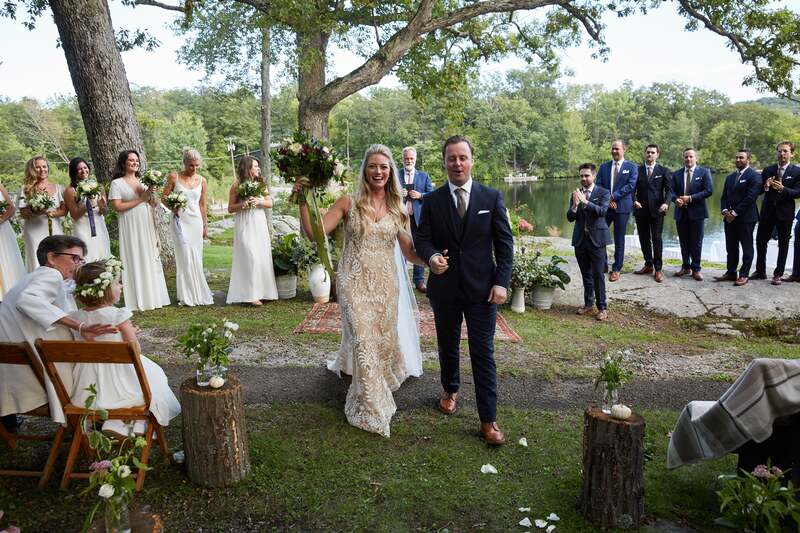 We asked brand new bride Olivia Mack McCool nearly immediately after her wedding how it went, what she’d do differently, and what her favorite moment was (it involves a boat ride). You live and you learn, but hopefully, these tips will inspire you to make your future affair one of a kind—just like you. Mack McCool, author of the newly launched (very tasty, clever, and healthy!) cookbook, Lunch!, got married at the end of September on a small, private lake and clubhouse in northern New Jersey, where the ceremony was right under the big pine trees facing the lake. “It was like a woodland dream—even the tree stumps we used down the aisle, naturally had little mushrooms on them,” she said. After the wedding, guests headed to the cocktail hour right on the grass in front of the idyllic clubhouse, and dinner was served inside the exposed wood interior clubhouse. Mack McCool told us the things she did that made her wedding so special—including all the tips and tricks to DIY it—and the one thing she’d wished she’d done differently. Mack McCool recommends focusing on what is really important to you, and not getting caught up in the things people say you need. The new bride and groom planned and paid for the whole affair themselves, which she says was obviously challenging, but at the same time, it made the wedding completely “them”. “We chose to keep the food choices very traditional and not too fancy, because my theory is that if you don’t have a lot of money to spend keep it simple,” says Mack McCool. “I think where people fail is trying to do over the top things with the food to cover up the fact that they are on a budget, this is when things go awry.” To keep things simple yet “them,” Mack McCool opted for foods she grew up on, including imported Prosciutto Di Parma, fresh handmade mozzarella, and risotto. Naturally, for a foodie like Mack McCool, eating and drinking options at the reception are going to be one of the main focuses, and while she was focused on keeping the food simple, she also wanted to splurge smartly on the items she absolutely loves. Her big splurge was in assuring the foods she served on her raw bar—including oysters, clams and crab claws—were of the utmost quality. Tasty raw bar aside, Mack McCool wanted the reception to feel like one big dinner party, which meant fun, high-quality foods like “copious amounts of Italian cured meats,” a guy literally pulling fresh, still warm mozzarella on site, and braised short ribs. For dessert, she offered freshly-fried apple cider donuts, because you gotta have apple cider donuts in New Jersey in the fall! For the long rectangular dinner tables, she chose all-white linens (“Again keep it simple if you have no $$!”), and then simply decorated the tables with candlesticks and votives (borrowed from friends’ past weddings), small floral arrangements (which an old friend did), and place cards (that Mack McCool hand wrote). You might be tempted to take on big, day-of tasks, but try to outsource to friends and family so you aren’t stressed with a big to-do. Like, floral arrangements, which seem simple, especially to a seasoned stylist. But putting others you trust in charge of it instead will save you a lot of effort. “Although I’m also quite good at floral arrangements, doing your own bouquet is a nightmare,” says Mack McCool. “You would never have time the morning of the wedding.” She bought flowers from a market, and a very talented, previous boss (super talented stylist Jocelyne Beaudoin!) created the beautiful, very unique yet simple, ceremony space and dinner table bouquets. While DIY’ing things for your wedding can be a lot of work, and maybe not always look as you’d like, there are a lot of things that Mack McCool did to keep costs down, without compromising a ton of time or quality. Invitations: Paper invitations can be a huge, huge cost. Which is why Mack McCool and her husband Photoshopped their own and printed it on their own. Cake Decorating: Although the caterer made the wedding cake, McCool had her stylist assistant decorate it quickly day-of with fresh flowers, which added a super special, personal touch to a simple white cake. Hair: If you happen to be great at your own hair, consider DIY’ing it (testing out your look many, many times before the wedding day, of course!). “I’m really good with hair and the thought of managing one more person that day, and spending money on something I’m good at seemed annoying,” says Mack McCool. The bride and groom planned the entire event themselves. But thinking back, she would have liked a day-of wedding planner. “There were so many day-of logistics that I couldn’t be on top of because I was busy getting ready. It would have been great to have someone handling that,” says Mack McCool. Everything came together perfectly, she says, but in the end, the stress would have been great to avoid.